We live in a globalized world. It’s dynamics bring out fundamental and irreversible changes everywhere. These changes come along with anxiety and suspiciousness, especially toward the transcultural dimension of globalization. Art can shift perception, it has a sensual willingness in its approach to the world, that opens our way of looking and thinking. Going beyond purity, is consulting established views, habits and traditions and helps to cope with upcoming changes. The ability to shift the perception of the so called “own” allows a closer view of the other. It allows tolerance and curiosity. Dimitri de Perrot’s work can’t be categorized. 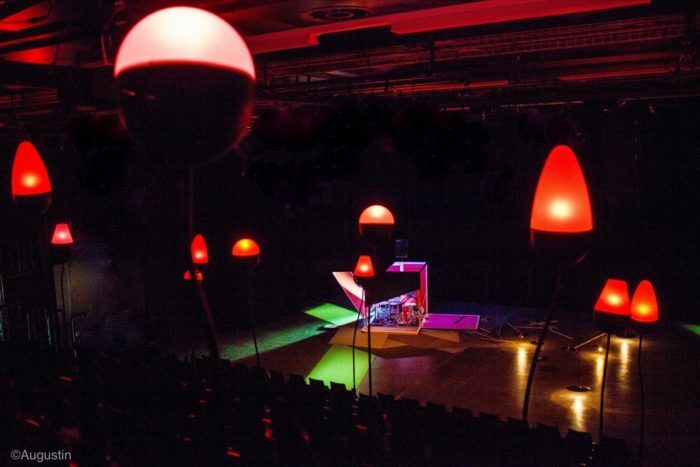 He mixes sound-art, performance and scenography to a interacting scenic sculpture. His attention focuses on things, sounds and surfaces, which we normally overlook, which we no longer really perceive in everyday life. He plays with affects, fears, and hopes to question established habits and projections. In this lecture he will give us an inside view of his artistic work, strategies and doubts. Dimitri de Perrot is a Swiss sound artist, director and stage designer. His artistic research focuses on collective memories, social conventions and individual perception. He worked for many years with dancers and circus artists and staged several interdisciplinary theater projects. In his recent works his interest focused on the relation between sound, space and audience, blurring the boundaries between truth and fiction to reach an increased awareness and the ability of shifting perception. How can we face the demanding evolution of our time, without freezing in fear? Dimitri de Perrot’s is a Swiss artist. His work links music, composition, directing and scenography. His artistic research focuses on collective memories, social conventions and individual perception. He worked for many years with dancers and circus artists, staged different interdisciplinary theater and music projects, composed for film and theater and is co-founder and artistic director of the highly renowned Swiss theatre duo Zimmermann & de Perrot. In his recent works his interest focused on the relation between sound, space and audience, blurring the boundaries between truth and fiction. His work was shown in prestigious venues like New York’s BAM (Brooklyn Academy of Music), the Festival d’Avignon, the Barbican in London, the Théâtre de la Ville in Paris or the Sidney Opera House and was awarded by several international prices. Transcultural Collaboration is a graduate semester programme in the arts and design and a collaboration of six art universities from Hong Kong, Mainland, Taiwan and Europe. Its general focus is transcultural topics and its main working method is cross-disciplinary collaboration.